Recognized as one of the leading figurative painters in contemporary art, John Currin's ability to synthesize historical and contemporary styles is unsurpassed. His provocative images examine the tradition of painting, and the role of women in art. Currin first commandeered his status as an art world rebel by choosing to work in a conventional medium (painting) and subject matter (the figure) directly opposed to the post-studio, socially engaged art dominating the American avant-garde scene in the 1990s. He began painting young women modeled from old high school yearbook photographs in the late 1980s, resulting in the Yearbook Paintings (1989-90), his first coherent body of work. These paintings feature banal, deadpan bust-length portraits of teenagers, clichéd renderings of postured adolescent innocence. 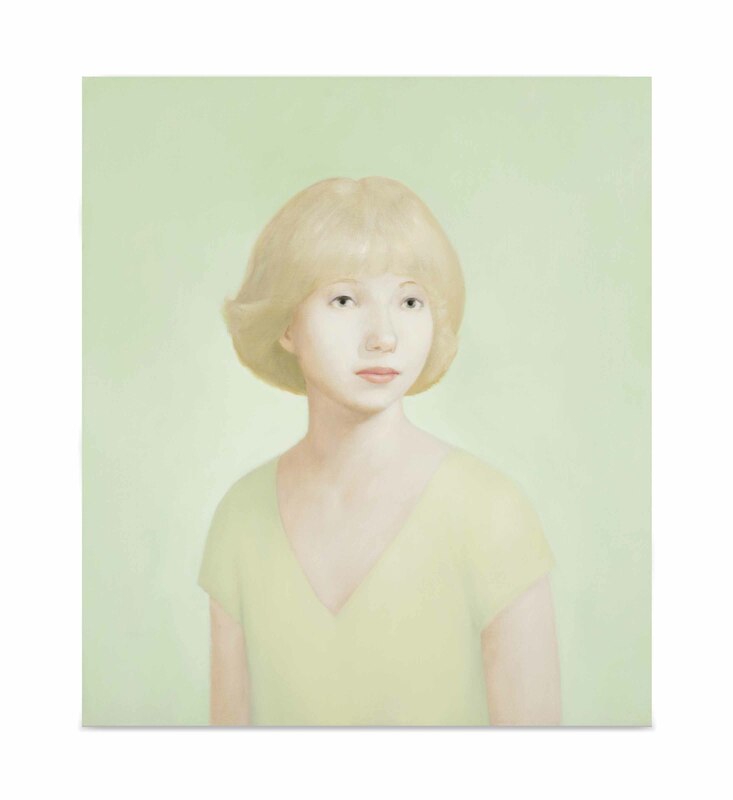 In Untitled, a young woman poses in a modest buttercream yellow dress haloed in soft chartreuse, thin, even brushstrokes forming a tabular picture plane. His subject's meticulously shaped yet old-fashioned cropped hair frames a plain, attractive face evincing practiced charm and boredom in equal parts. The Yearbook Portraits marked the inception of one of Currin's signature formulas: an veiled layer of deep irony, merged with a singular blunt aesthetic.